TrendSpider Review - How Good Is Trend Spider's Technical Analysis? Some see them as the newest kids on the block, others think of them as one of the savviest chart analysis platform available so far. Whichever way you look at them, the guys behind Trendspider seem to share one desire – which is to provide the charting software of choice for all traders. But do they measure up to the high expectations they have set on the market? Let’s find out. TrendSpider was founded in March 2018 following close to 2 years of market research, product design, and beta testing. Eventually, the Chicago-based company came to the limelight attracting more than 3,000 traders in less than 12 months. 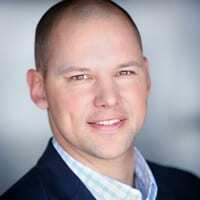 They may seem like underdogs compared to the like of eSignal and TC2000 but don’t let the numbers fool you, what we can confirm is that they are doing a really good job as far as software innovation goes. For instance, besides providing you with easy-to-use charts, they also provide some awesome technological input through machine learning. 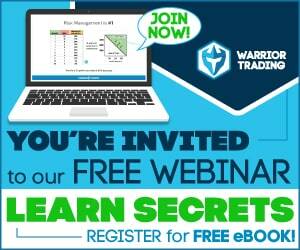 This seems like a breakthrough to traders looking for a dependable program. So, what you get here are some beautiful charts which are actually backed by powerful analysis tools. And that way, you can have an easy time managing indicators, tracking volumes and accessing alerts. This removes the need for long waits. Usually, you’re likely to spend long hours waiting for setups to materialize. This system, however, does that for you so you don’t have to rely on our eyes. There are three types of carts provided on Trend Spider. These are bar charts, hollow candles as well as the popular candlestick charts. Well, the charts are quite good looking plus they provide you with the ability to use a wide variety of indicators. Plus, you can choose between light and dark layouts. And if you’re looking to make some advanced customizations, this system has also got those ones right up your alley. Their automated charting software comes in handy especially keeping in mind the fact that it’s backed by the ability to generate 7 set time periods. Plus, you get the freedom to use all the attendant technical indicators no matter the price chart selected. In other words, this means that the system can automatically choose the best time period for you for each analysis. What’s more? You can compare up to 7 fully generated charts. Note that you can always choose the best chart for the right occasion. Yet another thing we’d like to note about this service is that their charts are quite comfortable to use and highly intuitive. And, therefore, no matter your level of trading experience (whether a beginner or advanced trader) you’re sure to find this a friendly platform to thrive on. If you’re looking for a platform that provides you with access to a wide range of data sets, TrendSpider would be a good bet. From forex, OTC markets, futures, cryptos, ETFs to equity indices, this is a great platform for anyone looking to explore a dynamic marketplace. However, it’s worth keeping in mind the fact that under the PRO plan you only get 3 data sets these being cryptos, ETFs, and stocks. Only at the ELITE plan will you find the full range of data sets. 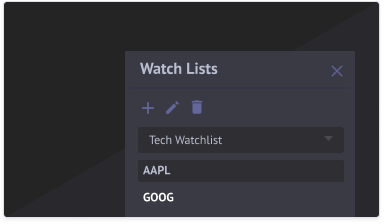 You can create different watchlists for the markets you’re tracking. Not only do you get the freedom to customize the watch lists but also the benefit of having the TS software analyze the markets for you and also scan for noticeable patterns. What’s more? You get real-time data which enables you to do real-time plotting and also set up automated alerts. The star of Trend Spider is that it has this built-in ability to locate hidden trendlines which would, otherwise escape unnoticed. And by using its lineup of settings, you can have an easy time evaluating different trendlines and also identify the most compelling ones. 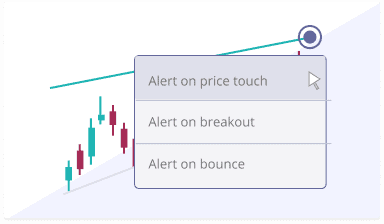 Almost all premium charting platforms provide alerts but TrendSpider provides that – and then some. In fact, you can have the alerts being highly specific e.g. when the stock prices bounce off a trendline and so forth. What’s more? You can easily narrow down the criteria so you only get helpful alerts. Otherwise, without filtering out the research, you’d have to put up with dozens of emails and SMS alerts all day long. And there is a lot more to these alerts than you can possibly imagine. Dynamic price alerts differ from static ones in the sense that they are based on the price action recorded on a dynamic price area. In that regard, you can use this system to set alerts that activate whenever a stock breaks below a trendline. Almost all charting platforms on the market utilize the popular binary criteria e.g. only activate the alert if a certain stock hits $10. TrendSpider breaks the norm by offering you three different types of triggers. With greater customization freedom, you can now go ahead and take your alerts game to a whole new level. You can, for instance, create an alert for a particular stock breaking its trendline or when it hits a support or resistance level. A wide range of customization options helps you to only go for the alerts that matter. This, in turn, helps you save more time and enjoy your trading journey even more. It’s pretty obvious that Trend Spider is a highly accurate system all thanks to its built-in scanning and identification abilities. But without the knowledge needed to trade successful, one would still have a hard time making sense of this system and indeed how to succeed in stock trading. Luckily, you don’t have to make wild guesses when using TS. They provide lots of learning materials on their site through their blogs, demo videos, and one on one training. Of course, we would have wished to see them generate more educational content but so far so good. They still have some ground to cover on this front, though. This system provides you with built-in indicators, over 40 of them actually, along with the ability to add some more. In fact, the like of MACD, RSI, SAR, moving averages and Bollinger Bands can easily be added from either the upper or lower charts. What’s more? You get multi-frame analysis which makes it easier to conduct overlaying analyses as well as compare different stock at a go. Trading experts are in agreement that multi-time frame analysis is the next frontier in gathering market intelligence. And, therefore, we are glad to learn that you can find this kind of functionality using TrendSpider. There are three plans under the Trend Spider’s menu. The first one is actually a 7-day trial plan which enables you to get a feel of how the system works. The flipside of opting for the free package is that you only get delayed data feeds. What’s more? The free plan normally expires after 7 days and you’d need to upgrade your membership to continue using the charting platform. Another downside is that you don’t get phone support which for now is a preserve of those with paid accounts. This actually part of the free plan only that after the 7-days are over, you can pay up to continue accessing the features of the free account. And of course, you’ll still have to put up with the limitations of lack of phone support and delayed data feeds. This package costs $213 per year. Just one tier above the Analyst Plan is the Pro Plan which provides you with among other things access to real-time data feeds, regular trading hours and one-on-one training. This is a fantastic package to go for especially if you want to limit your focus to US stocks, ETFs and cryptos. The Pro plan goes for $297 per year. Under the Elite Plan, you’ll get access to real-time data feeds along with access to all major stocks markets, crypto and also forex. On top of that, you get free one-on-one training and unlimited alerts per month. 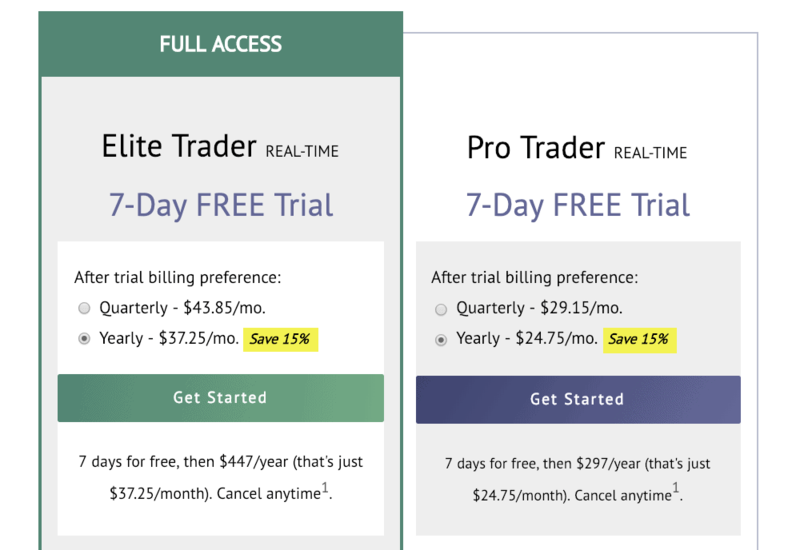 This plan will cost you some $447 per year and unlike the Pro Plan provides you with access to OTC US stocks and Forex in addition to US stocks, ETFs, and crypto. The only way to know whether or not this site is worth your bucks is by playing with its awesome features. And fortunately, you get a 7-day free trial specifically for that. In our view, the software is well made and their charts are among the best that we’ve come across so far. It’s only a matter of time and these guys will take over the markets. Watch this space. GuruFocus Review – How Good Is This Service?